Hello, there! It's Lynnea back with a few more cards using the Lace Leaf stamp set from Concord & 9th. I love how versatile this set is! Remember that you can pick it up in the Butterfly Reflections, Ink Shop when you're done here! Here's my first card. The leaves are finally falling and there's a chill in the air up here in NE Pennsylvania! This is one of my favorite times of year (second only to Christmastime!). I started this card by using the Lace Leaf stamp set to stamp some orange/red ink and some yellow/orange ink to make an ombre leafy background at the top left and bottom right of my card. I embossed the leaf overlay with Versamark ink and some gold embossing powder. I stamped the sentiment with Memento Tuxedo Black ink and that was it! I wanted to take this autumn stamp set and make it not-so-autumny. 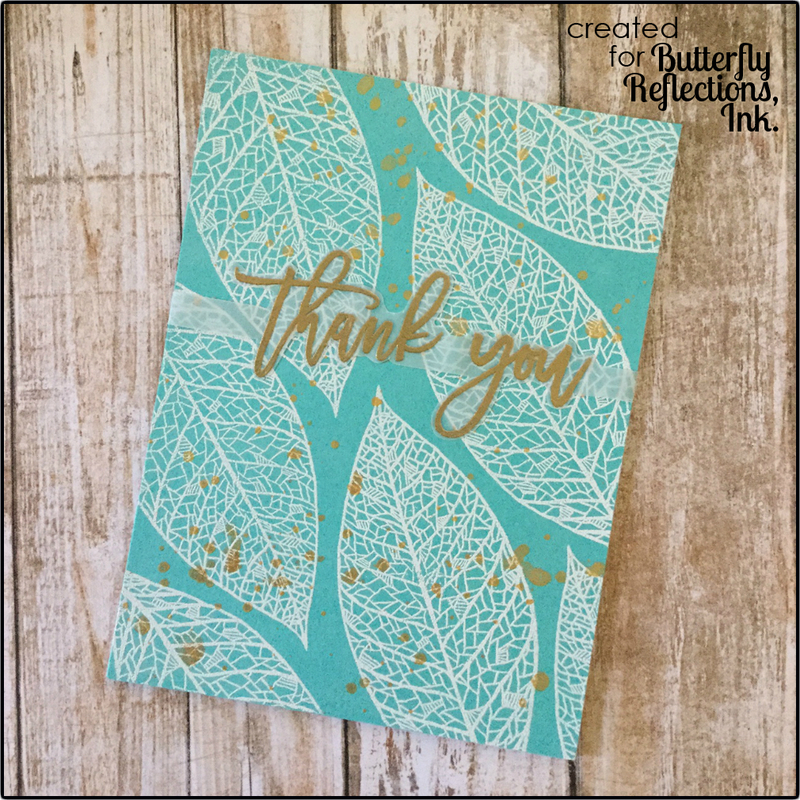 So I stamped the leaf image repeatedly with Versamark ink on some teal paper and embossed the panel with white embossing powder. I stamped the sentiment from the Script Greetings set from Right at Home onto vellum and embossed it with gold embossing powder. I used scissors to trim around the swirly letters to make the vellum just a tiny thin strip. I stuck the strip onto the card and spattered some gold paint over the panel and the card is done! 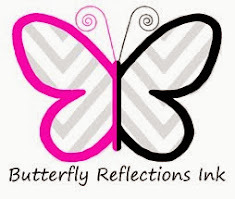 Head over to the Butterfly Reflections, Ink Shop to get your hands onto these products! I can't wait to see you again next week! Bye!